We have come to think of Japanese food as being tempura, teriyaki, and sushi but it is miso soup that the Japanese will not want to live without. 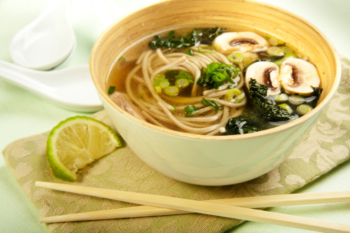 Originally, miso soup was served as a breakfast food. I remember the week I had a little Japanese girl visiting who could not speak English; when I made her this soup with the addition of udon noodles, she was so happy and said Oishi ( 美味しい ) many times which means delicious! Fortunately, I understood because I had been in Japan and said Oishi at many meals. 1. Soak Kombu, Wakame, ginger and shitake mushrooms in 3 cups of water in a saucepan for 30 minutes. 3. Simmer for 30 minutes. 4. Strain out the kombu, wakame and mushrooms saving the liquid. 6. Add spinach leaves and tofu if you are adding it. 7. Simmer on medium heat till spinach leaves have wilted. Turn heat off. 8. Add miso. (Never boil miso because that kills the live cultures which are so beneficial). Stir the miso thoroughly into the water and then add this back to the pot. As Miso is high in sodium, adjust how much you add to taste. *This miso is the most suitable as it is smooth and creamy tasting…..it has a velvety texture and almost sweet taste. For detailed information on each of the seaweeds read Sea Vegetables Health Benefits. Get healthy tasty vegan gluten free recipes and useful lifestyle tips sent to you once a week, subscribe to the newsletter. You can also learn how to plan and prepare super healthy meals with my 2-5-30 Healthy Diet Online Courses. I’m making some now. It is one of my daily, health habits. Thank you, for the recipe! Well Johnny do let us know how it turned out. What are wakame and kombu? I’d like to make the soup but don’t know where to look for these 2 ingredients. Let us know how the soup goes. I have found Wakame and Kombu at my local Chinese grocer also at a couple of chain healthfood stores. I find that a package of each which comes dry will last a long time. If you don’t live near any of these, there are excellent mail-order sources. I enjoy a cup of Miso soup from Diana’s recipe, nearly everyday. Thank you. Johnny, that is great! Also, thank you for the tips on where to get seaweed. Great recipe – I tend to use whatever I have in the way of vegetables and noodles. Sometimes I’ll add tofu or a beaten egg, even shrimp. And – gasp – I use powdered dashi to make the stock.